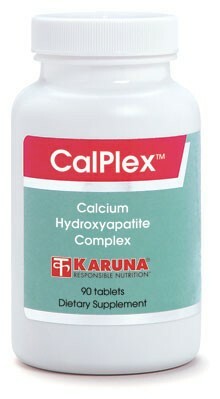 CalPlex supplies an efficient complex of nutrients and cofactors that support bone strength and maintenance. Calcium is supplied as citrate as well as in a freeze-dried, whole-bone bovine extract. This extract is also a rich source of bone matrix proteoglycans and trace minerals, and has been shown to be exceptional for supporting bone maintenance and repair. A generous amount of vitamin K is included, far more than in most other bone support products, and vitamin D is supplied in the preferred D3 form for maximum bioavailability. These nutrients, along with vitamin C and manganese, work together to support optimal bone density and help skeletal structures maintain their integrity during minor traumas. Refer to About...Calcium, also the About...Vitamin D, Magnesium and Other Bone-related Factors. Whole bone bovine extract is a rich source of calcium, trace minerals and structural support molecules, which are effectively preserved by freeze-drying. CalPlex contains microcrystalline hydroxyapatite complex from whole bone, which has been shown to support bone remineralization (Am J Clin Nutr 1982;36:426-30) and optimum skeletal repair processes (Manitoba Med Rev 1965;45:92-6). Suggested use for adults: 2-4 tablets per day, taken with meals, or as directed.